Back in the day BK - Before Kids - there was skiing and only skiing. Be on the first chair in the morning, ski like crazy til the last chair in the afternoon, eat dinner, collapse into bed and then do it again the next day. Then, kids came along and - guess what? As much as they liked to ski or ride, they wanted to do other stuff. Take time off to snowshoe, ice skate, visit a hot springs - whatever. A whole new world opened up for Dad. Non-skiing alternatives at ski resorts have proliferated in recent years. Of course, surveys show that the number one non-ski, ski-area pastime is shopping. But, this Dad's not going there (no expertise!). As to other alternatives - here's a look at some of what's out there in the East - plus a bonus look at some other special amusements. Lake Placid, NY (lakeplacid.com) or (orda.org) : Lake Placid offers the most off-slope doings of just about anywhere in the U.S., but our absolute favorite thing to do is the Lake Placid Toboggan Chute on Mirror Lake. For five bucks per adult and three per child, plus a $5 toboggan rental fee, you can slide to your heart's content in 2.5-hour or four-hour sessions. We dare you to take the slide-backwards challenge! Few other sites offer the chance to ice skate and Nordic ski in the footsteps of Olympians. 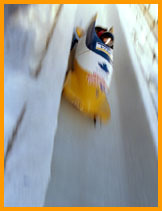 Here, too, you can ride the bobsled with a pro driver, learn how luge riders train, watch international hockey, see an ice show extravaganza, visit an Olympic Museum, and watch ski jumping and freestyle aerial competitions. Oh, the list goes on. Take advantage of the Winter Passport; it includes: a Cloudsplitter gondola ride, one cross country day pass at the Verizon Sports Complex and admission to the sliding track, admission to the MacKenzie-Intervale Ski Jumping Complex including the skydeck observation area atop the 120-meter tower, admission to the 1932 and 1980 Winter Olympic Museum and three-time admission to public skating on the Sheffield Speed Skating Oval, and discount coupons for a bobsled ride, luge Rocket ride, novice ski lesson, cross country trail pass and ORDA Store merchandise - all for $25. Quebec City, Quebec (www.quebecregion.com): Here's the deal with Quebec City - it's North America's only walled city and lets you have an urban/outdoor vacation/international simultaneously; it reeks with history, charm and French flair; it's a place where you can cross country ski right in the middle of town; learn to ice climb just ten minutes from the Old City; winter horseback ride at the base of Mont Ste-Anne Resort; dog sled in any number of places; stay overnight in a hotel made of ice; slide the "sugar hill", created from the spray at the base of the magnificent Montmerancy waterfalls; visit various museums; see a show or the multi-media spectacular at the Cathedral; go tubing at Stoneham Resort and other spots, and practice your French all the while. Quebec City's piece-de-resistance is its Winter Carnival. From Jan. 28 - Feb. 13, 2005, the city becomes a full winter wonderland, with incredible ice sculptures, night parades, the most remarkable wintertime canoe race you'll ever watch, ice fishing, snow rafting, dogsled rides, sleigh rides, snowmobile rides, entertainment, a winter amusement park with sledding, ice climbing and a variety of rides and attractions. It's the premier winter carnival on the continent. Loon Mountain Resort, NH (loonmtn.com): Few resorts offer more on-site snowsliding alternatives than Loon. Among them: snow cycling, "extreme" tubing, tubing for tots, "regular" tubing, snow cycles (snow bikes), Sno Scoots (BMX-style snow bikes), ice skating and snowshoeing. Oh, and there's horseback riding, too. Smugglers' Notch, VT (smuggs.com): As might be expected from one of the premier family resorts anywhere, Smuggs presents a full menu of off-slope options. There's swimming, hot-tubbing and ice-skating, of course, but how about indulging in a little creative expression at a workshop in country stenciling, fabric stenciling, painting or sculpting? Goodtime Charlie, who resort describes as their Director of Fun, makes family-friendly apres-ski happenings happen, like weekly dances, bingo, karaoke, family game nights and Smuggs' Showtime Theater. 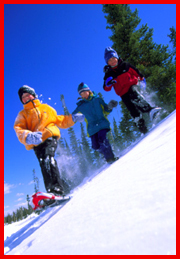 Among the other options are: sledding parties, cross country skiing and a Snowshoe Adventure Center. The FunZone features music and huge inflatable attractions like the 360-degree obstacle course, jousting, jumping spots Bouncy House and Chopperville, miniature golf, Omni-Ball and basketball. Toss in two teen centers, each equipped with Internet access, Playstation 2, X Box, video games, music, dancing, a "club" atmosphere and no parents, and you've got a lot to choose among. Jack Frost/Big Boulder, PA (big2resorts.com): One of the best tubing complexes in the east, you get: five single snow tubing chutes and three family snow tubing chutes at Jack Frost Mountain; and 13 single snow tubing chutes served by four lifts at Big Boulder. Seven Springs, PA (7springs.com): Ohmygosh, we've encountered few places that cater to off-slope and/or nasty weather days better than Seven Springs. Sure, they've got a tubing park, but it's the indoor activities - all gathered in one spot in the main base area - that boggle the mind. Consider bowling, roller skating, miniature golf, two arcade centers, weekly teen dances and a huge swimming pool. Toss in sleigh rides, snowshoe tours, hot tubs and a full slate of live entertainment, and you've got something special going on. Beyond these specific eastern locations, we'd like to highlight a few special off-slope adventures we's experienced over the years - activities that have made various vacations special. Snowshoeing & Snoscooting at Winter Park: We wandered into the hills and aspen glades above Snow Mountain Ranch to follow wildlife tracks, and explore off the beaten path. And, snoscoots (mini-snowmobiles perfect for ages 9-15 who can't rent real snowmobiles) became a must-do for three visits. Hot Springs Water Sliding in Steamboat Springs: We've frequented hot springs in various places, but just as you arrive in Steamboat's downtown from the ski resort, there's a hot springs water slide center. Unique, to our knowledge. Ski Jumping in Park City: Yes, at the Olympic Park you can sled the bobsled run, but take a ski jumping lesson. You need only be an intermediate skier and you use your own alpine equipment; within two hours we were flying off the ten-meter jump, and some folks (kids, too) make to the eighteen-meter hill. Very cool. Ice Skating in Lake Placid, Sun Valley, Beaver Creek and Squaw Valley: each has its own special qualities. In Lake Placid, as we noted above, you can skate the speed oval where Eric Heiden won five golds; at Sun Valley, it's the rink where Sonja Heine performed; in Beaver Creek it's, well, it's just one fine setting in the center of things and above the concert hall; and, in Squaw Valley it's skating a the top of the mountain. Outdoor Heated Pools Anywhere: Few pastimes as simple as this can entertain your kids for such long periods of time. The idea of swimming outdoors when the air is sub-freezing - and maybe taking a roll in the snow between splashes - just amazes and amuses them. Indoor Golf at Okemo: If your child plays golf, at Okemo you can play many of the world's greatest courses on their computerized simulator at the indoor golf center. This Dad proudly shot 26-over for nine holes at Pebble Beach on his last round - a pretty accurate re-creation of his ability, we might add! Wildlife in Jackson Hole: The wagon/sleigh ride into the elk herd is a must - the herd is huge and you really get up-close and personal; it's an integral part of a visit to the National Museum of Wildlife Art. Also, a day exploring Grand Teton and Yellowstone National Parks with Wildlife Expeditions (wildlifesafari.com) lets you see wild animals close-up, in their natural habitat via comfortable vehicles equipped with opening roof hatches, binoculars, and spotting scopes. Durango Mountain Resort's total Adventure Ticket: Stay at DMR for four days/nights, use your four-day lift pass to ride Purgatory Mountain for three days, and then exchange a day on the hill for one of our ten other activities, including snowmobiliing, tubing hill, nordic skiing, spa and massage, snowshoe tour, dinner sleigh ride, or even a ride on the Durango & Silverton Narrow Guage Railroad. Or, although it's not longer part of Total Adventure, drive for a day a Mesa Verde National Park. ...... Mitch Kaplan is the author of The Unofficial Guide to the Mid-Atlantic with Kids, The Cheapskate's Guide to Myrtle Beach and The Golf Book of Lists. He is a contributor to The Unofficial Guide to New England & New York with Kids and to the annual guide Ski America & Canada.